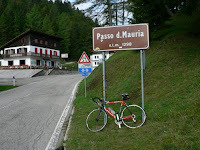 Passo Mauria, top at 1298 m, 9.1 km long, 404 m altitude gain, 4.4% average gradient, difficulty 42.01. 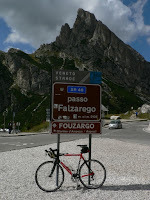 Passo Falzarego, 2117 m, 16.4 km, 913 m, 5.6%, 82.90. 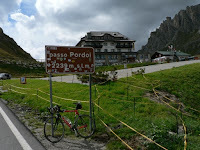 Passo Pordoi, 2239 m, 9.4 km, 637 m, 6.8 %, 72.70. 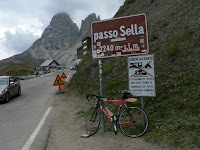 Passo Sella, 2214 m, 5.5 km, 399 m, 7.3%, 60.94. 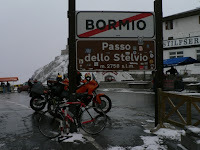 Passo Stelvio, 2758 m, 24.3 km, 1808 m, 7.4%, 172.26. 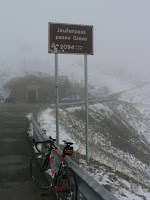 Passo Giovo, 2099 m, 19.9 km, 1404 m, 7.1%, 131.77. 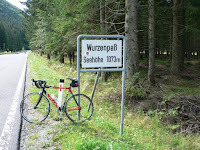 Wurtzenpass, 1073 m, 7.2 km, 546 m, 7.6%, 128.17. 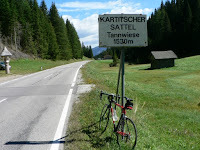 Kartitscher sattel, 1526 m, 9 km, 436 m, 4.8%, 49.68. Helo, I wrote to you a few months ago. Since then i started to put everithing toghether in the way you does. I did my first trip to la Gran Sabana in Venezuela. It was a 3 days. realy a bit too much for me. I plan to repeat the journey and go to puertos Paez fron Cuiidad Bolivar. Thank you for yours pages and share whit us. Good luck and keep updating us of your progress.